General Ignacio de Veintemilla cancelled the 1862 concordat, but found himself unable to govern without Church support. The result was a new concordat which was very similar to its predecessor. The next year Veintimilla was forced to resign, but his concordat remained. 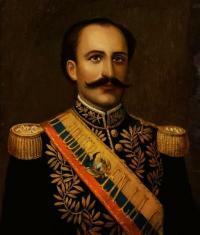 Like all presidents of Ecuador, Ignacio de Veintemilla was invested with the “presidential sash” which proclaimed “Mi Poder en la Constitución” (My power comes from the Constitution). Yet in 1882, just a few days after the new concordat came into effect, he felt secure enough of Church support to launch a coup d’état that turned him from a constitutional president into a dictator. In spite of all these measures, in 1882 Veintimilla found himself facing a rebellion and felt obliged to seek Church support. The new concordat went into effect just a few days before Veintemilla assumed dictatorial control. The next year, however, he was overthrown. In Columbia, as elsewhere, the dictator went but his concordat remained. Thiis is what happened after the overthrow of the European fascist dictators, Hitler, Mussolini, Franco and Dollfuss, of the Latin-American dictators Duvalier, Trujillo, Aramburu, Onganía and Bermúdez and of the African President-for-Life Houphouët-Boigny. Veintemilla’s policies, as might be expected, alienated numerous radical and moderate Liberals, many of whom suffered persecution and exile at his hands. The president found himself driven to seek the support of his former enemies, the Conservatives, in order to sustain himself in office. He sought to gain their adherence by modifying his church policy an action facilitated by the recent change in the papacy itself. In 1878, the adamantly conservative Pope Pius IX died and was succeeded by the more liberal and democratically inclined Leo XIII. The new pope accredited Msgr. Mario Mocenni to Ecuador as the apostolic delegate, with power to negotiate a revision of the 1862 concordat with Ecuador’s representative, General Cornelio E. Vernaza. Veintemilla had received congressional approval for this project in 1880 and the new treaty was signed in May 2, 1881. Ratifications were exchanged in March 1882, and it was proclaimed to be in force just a few days before Veintemilla assumed dictatorial control of the nation. The new concordat, consisting of twenty-five articles, differs little from its predecessor. The exclusive legal establishment of the Roman Catholic Church is maintained. Church control of education is continued. Article 8 defines more precisely the jurisdiction of the ecclesiastical courts and their relationship to the civil courts. Article 9 subjects to state taxation those properties owned by the clergy and the church which are not exclusively devoted to charity. Article 11, while retaining the tithe as a normal means of Church support, permits the adoption of some other mutually acceptable mode of financing. Articles 12, 13 and 14 concede the right of patronage to the president of Ecuador. Article 22 obligates Ecuador to seek to convert all unbelievers within her territory, and Article 24 revokes al Ecuadorian legislation opposed to the treaty’s terms. Other provisions remain essentially as they were in the 1862 document. The decision to seek a new concordat was applauded by numerous Conservative clericalists and by many of the Ecuadorian clergy. Veintemilla hoped to solidify support for his administration by appointing as archbishop of Quito the exiled and resigned first bishop of Riobamba, José Ignacio Ordóñez. That dramatic gesture of promoting the bishop who had earlier excommunicated the president was made in 1882, prior to The Transformation, which ended Veintemilla’s constitutional exercise of power. 1. Frank MacDonald Spindler, Nineteenth Century Ecuador: An Historical Introduction (1987), p. 99.